Big, frilly petals in gorgeous colors make Cattleya the hands-down favorite of many orchid growers. Members of the Orchidaceae family, Catts are among the best-known. This is the genus you'll find in Mother's Day corsages. Although there are more than 50 cattleya species, most you'll find today are complex hybrids. Cattleyas usually bloom in clusters of 2 to 6 flowers. You'll find them available in a range of colors, including pink, white, yellow, purple and red. Their lip colors are usually contrasting to the rest of the flower. You can expect each flower to last about a month. Beautiful cattleyas are native to the tropical jungles, where they thrive in warm, misty breezes and dappled sunlight. 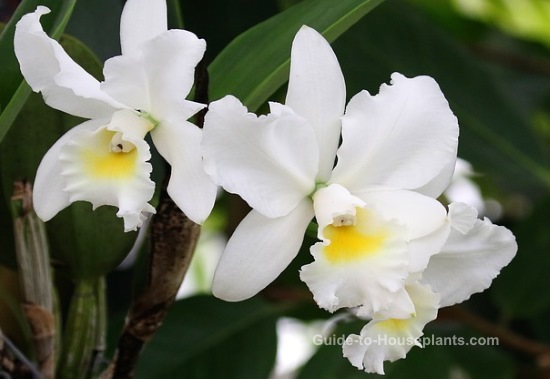 Catts make their home near the treetops in their native habitat and need brighter light than many other orchids. So, how do you create a compatible environment in your home? Fortunately, this is easier than it seems. Cattleya orchids may refuse to bloom if they don't get enough light. Put your orchids in a well-ventilated location where they'll get plenty of light, but out of direct sun. If you don't have a spot near a window, fluorescent grow lights work beautifully. Use 1 warm white tube and 1 cool white tube under a reflector. Put your orchids about 8 inches (20 cm) beneath the light and keep the lights on for 14-16 hours a day. It's important to give them darkness at night. Plants need a rest, too. Gorgeous Cattleyas are among the showiest orchids, as well as easy for beginners. Cattleya (pronounced cat-lee-a) labiata was discovered in Brazil by William Cattley, a horticulturalist who brought the plant to England in 1818. This is the species upon which the genus is based and what sparked a passion for growing catts in the early 19th century. To repot...or not. Fir bark mix breaks down after a couple years and needs replaced. Catts can be finicky about being repotted at the wrong time. In fact, some even resent being in a pot. However, if you get the timing right, orchids will forgive the disturbance and will bloom on schedule. The best time to repot your orchid is when new growth begins, shortly after blooming is over. Pot them in a smallish container; Cattleyas bloom best when their roots are confined. Besides, using a too-large pot will hold too much moisture, which can lead to root rot. Got a reluctant bloomer? Give your orchid slightly cooler nighttime temperatures to spark blooming. A 15° difference will do. Cattleyas will tolerate varying temperatures from 60° nights up to 85° days. 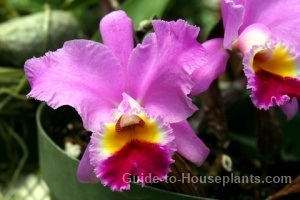 They usually flower once a year, and with good cattleya orchid care, you can expect blooms year after year. Frilly petals and a large lip in a contrasting color are the hallmarks of Cattleyas orchids. 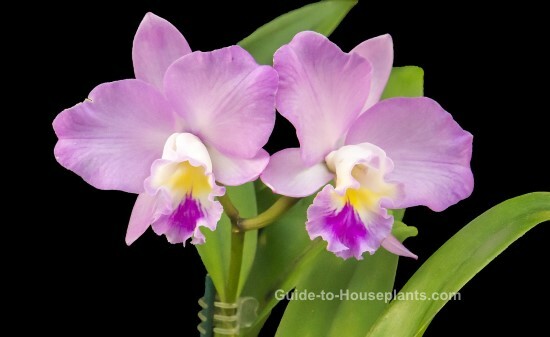 You'll find Cattleya orchids for sale most often in spring, when most are in bloom. However, their blooming time varies by species. Light: Bright indirect light year-round. Some direct morning sun is fine. Light, yellow-green leaves are a sign of too much sunlight. Move your orchid to a shadier spot. Water: Water thoroughly and allow top inch of soil to dry between waterings. Cattleyas store water in their thick leaves and pseudobulbs, making them more tolerant of dry soil than wet. Humidity: Moderate to high, preferably 50-70% relative humidity. Raise the humidity if it drops below 50%. Use a humidity tray or room humidifier to increase the moisture in the air. Grouping plants also helps to maintain the humidity around them. Temperature: Slightly cooler (60-70°F/16-21°C) nights, and warmer (75-85°F/24-29°C) days will trigger blooming. Fertilizer: Feed every 2 weeks with orchid fertilizer while plant is growing (spring and summer), and once a month the rest of the year. Propagation: Divide pseudobulbs into clumps of 3 or more and pot in separate containers.